ASCII and Unicode character encoding enables computers to store and exchange data with other computers and programs. Below are lists of frequently used ASCII and Unicode Latin-based characters. For Unicode characters for non-Latin-based scripts, see Unicode character code charts by script. If you only have to enter a few special characters or symbols, you can use the Character Map or type keyboard shortcuts. See the tables below, or see Keyboard shortcuts for international characters for a list of ASCII characters. Many languages contain symbols that could not be condensed into the 256-characters Extended ACSII set. As such, there are ASCII and Unicode variations to encompass regional characters and symbols, see Unicode character code charts by script. If you have trouble entering the characters codes for the characters that you want, try using the Character Map. To insert an ASCII character, press and hold down ALT while typing the character code. For example, to insert the degree (º) symbol, press and hold down ALT while typing 0176 on the numeric keypad. You must use the numeric keypad to type the numbers, and not the keyboard. Make sure that the NUM LOCK key is on if your keyboard requires it to type numbers on the numeric keypad. To insert a Unicode character, type the character code, press ALT, and then press X. For example, to type a dollar symbol ($), type 0024, press ALT, and then press X. For more Unicode character codes, see Unicode character code charts by script. Important: Some of the Microsoft Office programs, such as PowerPoint and InfoPath, cannot convert Unicode codes to characters. If you need a Unicode character and are using one of the programs that doesn't support Unicode characters, use the Character Map to enter the character(s) that you need. If ALT+X converts the wrong character code into Unicode, select the correct character code before pressing ALT+X. Alternatively, precede the correct character code with the text "U+". For example, typing "1U+B5" and pressing ALT+X will always return the text "1µ", while typing "1B5" and pressing ALT+X will return the text "Ƶ". 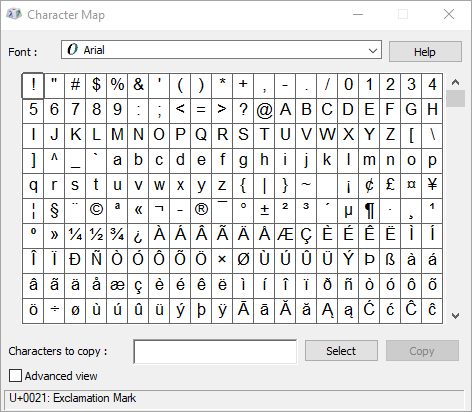 Character Map is a program built into Microsoft Windows that enables you to view the characters that are available in a selected font. In Windows 10: Type "character" in the search box on the task bar, and choose Character Map from the results. In Windows 8: Search for the word "character" on the Start screen and choose Character Map from the results. In Windows 7: Click Start, point to All Programs, point to Accessories, point to System Tools, and then click Character Map. Characters are grouped by font. Click the fonts list to choose a set of characters. To select a character, click the character, click Select, click the right mouse button in your document where you want the character, and then click Paste. For more character symbols, see the Character Map installed on your computer, ASCII character codes, or Unicode character code charts by script. For a complete list of the glyphs and their character codes, see the Character Map. For more information about typographic ligatures, see Typographic ligature. For a complete list of the ligatures and their character codes, see the Character Map. ASCII table numbers 0–31 are assigned for control characters used to control some peripheral devices such as printers. For example, 12 represents the form feed/new page function. This command instructs a printer to go to the top of the next page.